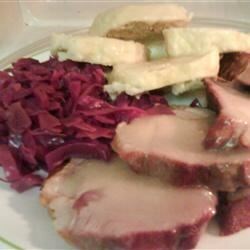 "This was my grandmothers recipe and it has remained a family favorite... It should be served with roast pork, sauerkraut and a nice glass of beer. A very traditional way to eat the leftover dumplings the next day for breakfast or brunch is to chop them up into cubes, pan fry in a little butter; then add eggs and milk, and cook as if you are making scrambled eggs. It's great." In a large bowl, stir together the flour, baking soda, baking powder, salt and sugar. Make a well in the center, and pour in the eggs and 1 cup of milk. Stir to blend, and add enough additional milk to make a moist battery dough, not like pancake batter. Use a sturdy wooden spoon to beat the dough at least 200 strokes, rolling it over and over in the bowl until smooth and an occasional bubble appears on the surface. Add the dry white bread cubes, and stir into the dough until they disappear. Bring a large pot of water to a boil. Place the dough onto a cheesecloth or white cotton cloth, and form into a loaf shape. Wrap the cloth around the loaf, and tie the ends. Place the loaf into the boiling water, and cook for 45 minutes, turning the loaf over about half way through. Remove from the water, unwrap, and cover with a tea towel. Let stand for 10 minutes. Fry bacon in a small skillet over medium-high heat until evenly browned. Set aside. Place the drained sauerkraut into a saucepan, and add enough water to cover the surface. Bring to a simmer over medium heat. Add bacon, and season with salt, pepper and caraway seeds. Stir together the cornstarch and water; mix into the sauerkraut, and simmer for a few minutes before removing from the heat. Slice the dumpling loaf. Drizzle dumpling slices with some of the roast drippings from the pan. Serve with sauerkraut. Please be sure that the bread cubes have been dried out. They should be hard. Sauteed onions should also be added to the sauerkraut. I have been trying to replicate my grandmother's knedlicky recipe for a while now- the cheesecloth is a great suggestion! Thanks!